Protesters gathered at the QT in Ferguson, Missouri on Tuesday evening to protest the shooting of Michael Brown who was killed on Saturday. The Ferguson rioting has forced an area food pantry at St. Stevens Episcopal Church to close its doors. The protesters appear more agitated as the sun begins to set in Ferguson. UPDATE: They’re marching in Ferguson. UPDATE: At least one hundred youths are gathering at Jamestown Mall in North St. Louis County. Group disturbance at Jamestown Mall in North County, Cars being dispatched. UPDATE: Police are asking the crowd in Ferguson to disperse or face arrest. 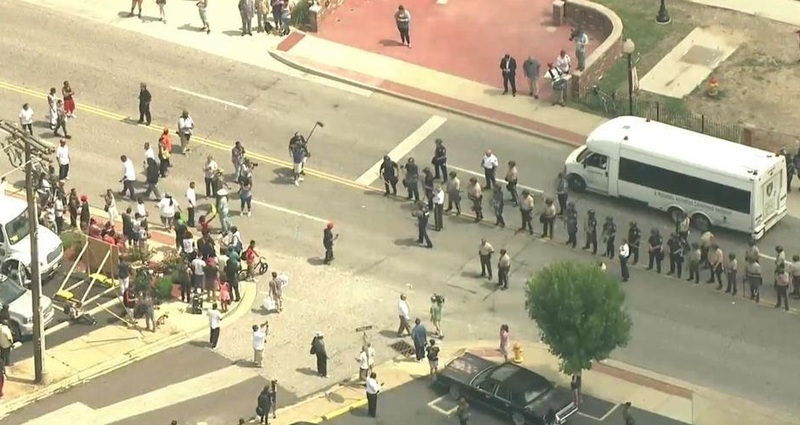 UPDATE: A large group is marching in north St. Louis County. UPDATE: Shots Fired in Jennings, MO. UPDATE: “Protesters” are throwing rocks and bottles at police. RIGHT NOW: Protesters in Ferguson throwing rocks and bottles on riot police. Police threatening mass arrests. UPDATE: Fire Alarm at 500 Jamestown. UPDATE: The scene is escalating. UPDATE: The News Commenter has live coverage from the Ferguson protests. UPDATE: At one AM police shot a man pointing a gun at officers in Ferguson. There has been another police shooting in Ferguson overnight. Around 1 a.m., four men in ski masks armed with shotguns approached a crowd at Sheffingdell Ct. and Chambers Rd. Police arrived to hear shots fired, and see people running. One officer chased a suspected shooter. Officers say the gunman pointed his handgun at the officer. The officer shot the man. The suspect was taken to the hospital in critical condition. Police recovered the suspect’s handgun. The officer was not injured. In a separate shooting at around 12:20 a.m., a woman was shot in the head in a drive-by shooting on Highmont Dr. in Ferguson. She’s expected to survive.